Source: KADIDIA.COM. Published | publié 21 05 2016. Translated from French by Beti Ellerson. Cinéaste Rahmatou Keita from Niger, author of a rich internationally acclaimed filmography, attended the Cannes Film Festival to promote her new film "Zin'naariyâ! "(Golden Alliance), which tells the love story of a man and a woman in the heart of Niger's desert. KADIDIA.COM: Tell us about the preparation of your new film Zìn'naariyâ! ? 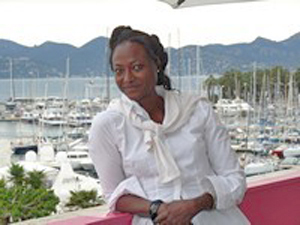 Rahmatou Keita: I would first like to specify that it is a film that is one hundred per cent African. I united Africa around this film. It is an African Union film. It was funded entirely by African countries, including Algeria, Niger, Congo-Brazzaville, Rwanda, Morocco and Uganda. It took eight years to find funding, one month for the shooting—as the budget was limited, and a year to do the editing and all the postproduction. It is important to note also that whatever the political orientations of the leaders of these countries that have agreed to finance the film, they are first and foremost advocates for Africa, who are sensitive to those things that are disappearing on the continent. How did you succeed in convincing these countries to finance your project? I was able to convince them by highlighting the importance of the image. I emphasised that the advancement of our cultures also involves the image. I am proud that all these countries contributed to making this film happen. Moreover, the Pan African Federation of Filmmakers, which brings together all of the diverse associations of African filmmakers and the Diaspora, is creating, with the African Union, an African film fund, in order to provide financing for projects. I think it will go into effect in two or three years. Can you tell us more about the love story that takes place in your film? It's a love story that takes place in the Sahel, in the Niger Sultanate of Damagarau built in the 11th century. The film is set in a beautiful location, with very beautiful architecture, as Niger is also characterised by ancient cities. I relate a Fulani love story in a Hausa State from a Sonrhay perspective. These are people from a very discreet culture. So I tell this story with great modesty. It's a love story with all of these cultural codes. Through this film, I also relate things that are in the process of disappearing in African cultures because the West is a steamroller that imposes its way of life on the world. In reality, behind this film, there is the desire to preserve the cultures and lifestyles of these men and women. If all this dies, the world also dies because it has been inspired a great deal by African cultures. The West wants to standardise the world, shape it in its own way. If the West destroys African cultures, it will die also because it will have nothing to feed itself. Take computer language, it was drawn from the pygmies’ method of a binary numeral system. But today pygmies are disappearing due to the deforestation that is destroying their way of life. Why is it important to participate in preserving the cultures of Africa? I think there is something to be done for all of these endangered cultures. As for me, I am playing a role in my own survival because it is these cultures that have nurtured me and it is with them that I can nourish my children. My films are my testimony to the world. What good will it do to imitate other cinemas when we have so much to tell about Africa? The future of cinema is in Africa. The future is in Africa. Everyone goes to Africa and Africans themselves are fleeing Africa. There is something amiss. It is through cinema that Africans must show what they are. It's always someone else who shows who they are; it does not make sense. Africans have survived despite the tragedies, invasions and a great deal of climatic damage. Peoples have disappeared for less than that. Africans have spirituality, strength and energy that have enabled them to overcome many misfortunes. It is up to them to reveal who they really are. La cinéaste nigérienne Rahmatou Keïta, auteur d’une riche filmographie saluée, à l’international, est actuellement au Festival de Cannes pour la promotion son nouveau film « Zin’naariyâ ! » (Alliance d’or), qui raconte l’histoire d’amour d’un homme et d’une femme au cœur du désert nigérien. Contactée par téléphone, elle revient sur la genèse de son nouveau long métrage de 90 minutes.